2014 Subaru Forester Pros and Cons: Why (Not) This Car? 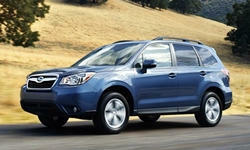 The Subaru Forester recently became the first 2014 model with over 100 cars enrolled in our survey. An introduction early in the calendar year helped. But clearly this car is popular with TrueDelta's members. Why have so many been buying a Forester? Much of this review of a Forester 2.5i Limited has been borrowed from an earlier one of the turbocharged Forester XT. That review was based on a brief drive and compared the Ford Escape. This one is based on a week with the car and compares the less driver-oriented Honda CR-V.
Limited adds leather. But much hard plastic remains. A week with the Forester only led me to further appreciate its driving position and large, upright windows. If you've been seeking a car you can easily see out of, few can match the Forester. Many manufacturers, in making their compact crossovers sleeker and swoopier, seem to have forgotten why many people buy crossovers in the first place. Not Subaru. The new Forester's windshield isn't laid way back. Its roof is high, but its belt line (base of the windows) isn't, and doesn't sweep dramatically upward until its last few inches. The pillars separating the new Forester's unfashionably large windows, even those at the back, are thin by current standards. Add it all up, and visibility is outstanding in all directions. This said, as in any crossover the base of the rear window is high enough off the ground that low objects (such as small children and bicycles) aren't visible through it. A rearview camera is standard on all but the least expensive Forester model. Though you also sit well above the instrument panel in the Honda CR-V, said instrument panel is much deeper than the one in the Forester. The view forward has a minivan flavor. To the rear, the Honda's pillars are much thicker than the Subaru's. Beyond visibility, people buy crossovers to get more space for people and cargo. As in previous Subaru Foresters, the 2014's ceiling is cathedral-high. I could have worn a top hat inside. If you're very tall, and have been seeking a compact vehicle in which you'll easily fit, you've found one. If, on the other hand, you've been seeking expansive elbow room, the Honda CR-V has more of it. And legroom? A combined (first and second row) figure of 81 inches tops every other compact SUV, including the otherwise segment-leading Honda (79.6 inches) and Toyota RAV-4 (79.8 inches). The Chevrolet Equinox offers another tenth of an inch, but with a 188-inch length (vs. the Forester's 181) and 4,083-pound curb weight (vs. the Forester 2.5i's 3,366) it's not truly compact. Subaru has worked no such miracles with shoulder room. At 56.5 inches, the Forester's is typical of the compact crossover class. Add in a small driveline hump (absent in the Honda) and three adults won't happily share the rear seat for long. But how many car owners put three adult-sized people in the second row for long, anyway? Measurements don't tell the entire story. The Honda's rear seat cushion is too low to the floor to provide adults with thigh support, and its rear seatback can be reclined to only two nearly identical positions. In constrast, the Forester's passengers enjoy a comfortably high rear seat that reclines through a broader range. One negative for rear seat comfort: unlike the Ford Escape (but like nearly all other compact crossovers, including the CR-V), the Forester has no rear air vents. Thanks to the tall, square rear body, cargo space is also the best in the segment, though not by as large a margin as the rear seat. Up front, there are plenty of bins in which to stash your stuff. Slight up-kick in belt line after the doors a rare concession to aesthetics. Clear conventional gauges and three big knobs for HVAC. Subaru's latest engines when paired with a continuously variable transmission (CVT) earn much better EPA numbers than their ancestors. The 2013 Forester rated only 20 mpg city, 26 mpg highway. The 2014 checks in at 24/32, about as good as you'll find in a compact crossover with all-wheel-drive. The CR-V manages 22/30, the RAV-4 22/29. Only the Mazda CX-5 comes close, 25/31 or 24/30, depending on engine size (you want the larger one with the slightly lower EPA numbers). In suburban driving I observed trip computer averages of 23 to 27 once the engine was warmed up. But 15 for the first couple of miles--it was cold and snowy the week I had the car. (This big difference when the engine is warming up is typical, but something many people don't realize when comparing their winter averages with the EPA ratings.) Summer fuel economy should be better. The Forester 2.5i Limited includes leather and a large sunroof in its $28,820 MSRP. Add $1,100 for the nav system. (Or don't, more on this below.) A Honda CR-V with navigation lists for $1,355 more despite having about $1,000 less content. You can't get leather upholstery in the Toyota. Drop down to the Forester 2.5i Premium to delete leather from the Subaru, and it squeezes in $400 below the RAV4 XLE. The sticker price might be relatively low, but you'll likely be paying close to it. Since 2014 Foresters are in short supply, dealers tend to discount them very little. Some might even be trying to charge over sticker. Discounts available on the Honda should drop its price below, even well below, the Subaru's. 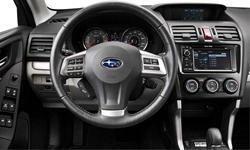 Subaru has upgraded the Forester's interior with the 2014 redesign, adding more soft-touch surfaces and contrasting stitching. The tested Limited adds leather seating surfaces. Even so, the ambiance remains practical and functional--even dated--rather than upscale or sporty. Nothing to entertain the eyes here. Designers have little pull within engineer-ruled Subaru, and it shows on the inside as well as the outside. Some parts continue to look or feel plasticky. This said, the Honda CR-V's interior is about equally plasticky, and adds some odd styling details to the bargain. The company's designers haven't yet sorted out what to do with their limited freedom. It's a Subaru, what did you expect to see? Rear seat roomiest in class, comfortably high, and reclines. Your ears won't have quite as high of an opinion of the new Forester as your rear end. Noise levels are considerably higher than in a Ford Escape, and a little higher than in some of the others. Far from loud, but (as with the interior styling) those seeking an upscale ambiance won't find it here. If you've been wondering why the Forester weighs less than its competitors (3,366 lbs. vs the Honda's 3,426 and the Toyota's 3,550), consider this a clue. A final "why not" applies only to Foresters with the navigation system. With this optional system all audio functions save volume must be handled through the touchscreen, and the displays are poorly designed. I haven't sampled the nav system in the CR-V, but the one in the Civic is about as bad as the Subaru's. Few past Foresters have sold because of how they looked, and this won't be changing with the new one. The new body is more square and less evenly proportioned than its predecessor, much less au courant competitors such as the Ford Escape and Mazda CX-5. As noted earlier, though, the Forester's boxier shape pays dividends in visibility and interior room. Which are higher priorities for you? If you've bought Subarus in the past, probably the practical stuff. Honda also tends to prioritize practicality, but has been prone to questionable styling flourishes in recent years. The CR-V's exterior includes some odd details, especially around its oversized derri�re. Looking at it, I struggle between laughing and looking away. While the CVT does strive to hold engine speed steady as vehicle speed climbs, the grumble of the boxer (opposed cylinder) four is a far better match for this treatment than the buzzing of the typical inline four. Even CVT haters will find little to hate here. We had some very heavy snow during my time with the Forester, and Subaru's all-wheel-drive system delivered its advertised level of traction. Without winter tires, though, handling at highway speeds was a touch dicey. Some crosswind-induced sideways slip on a snow-slicked highway notwithstanding, handling has moved from a "why not" with the Forester XT to neutral with the Forester 2.5i. As with exterior styling, my expectations shifted with the non-sport variant. I wasn't looking for thrills. I was looking for a vehicle that handled safely and predictably, and found it. The steering, though light with a delicate feel, is well-weighted and (surprise) not numb. This system's accuracy and feedback combined with the Forester's outstanding outward visibility, all-wheel-drive traction, and solid chassis dynamics to inspire confidence on snow-covered roads. More on those chassis dynamics. The non-turbo Forester plows and leans much less in hard turns than I expected given the SUV's absorbant suspension and light off-roading capability. The chassis tuning is fairly soft, yet this doesn't result in sloppy motions even under duress. There's even some joy in the nuances. In typical daily driving the Forester simply feels right, natural and intuitive, in a way that neither the squishier Honda nor the thumpier Toyota does. Subaru has a strong reliability reputation. To a certain extent, though, this reputation is based on ratings that focus on the first few years of ownership. Once Subarus pass the 100,000-mile mark they can become much more expensive to keep up than a Honda or Toyota. Subaru engines through at least the 2008 model year have head gaskets prone to failure. The current engine dates to 2011, and the earliest examples have begun to suffer from valve cover gasket leaks (much less expensive to fix than head gaskets). Will the 2014s age better? Perhaps, but it's too soon to say. It's nothing special to look at, and far from a BMW X3 substitute. But in everyday driving the Subaru Forester performs extremely well, with solid performance, good fuel economy (for a crossover), outstanding outward visibility, and a roomy interior. Plus its sticker price (if not its actual transaction price) undercuts the others. Put it all together, and it's easy to see why so many TrueDelta members have been buying the new Forester. There's a horizontally-opposed four-cylinder engine somewhere beneath that intake. No cover needed. Official cargo space with the rear seat folded is a class-leading 74.7 cu. ft.
Subaru provided an insured car for a week with a tank of gas. Ferndale Honda provided a CR-V for comparison purposes. They can be reached at 248-548-6300. 2014 Subaru Forester pros and cons, according to Michael Karesh: the best reasons for buying (or not buying) the 2014 Subaru Forester. Join TrueDelta to post your own impressions. We just traded in our 2012 CR-V for the 2015 Forester last Saturday. The CR-V certainly has more contemporary styling but the Forester is hands down more practical. I love the visibility the driver has in the Subie. Among the best of all vehicles today. With industry best crash ratings from IIHS, the great AWD system I have more peace of mind when driving the family about. A home run from Subaru! side note. A co-worker just purchased the 2014 CR-V a couple weeks ago. On his first drive to work he started to merge into the right lane of the local highway and nearly hit a car. His comment to me once he arrived at work. "I see what you mean about the rear pillars in this car, no visibility at all" It truly is terrible. Re: The leaky gaskets. They tend to give out after about 100,000 miles, and the repair isn't the cheapest -- upper three figures. But if you get them replaced with metallic ones, you can run these engines 250,000 miles. I agree with the two comments above, if it cost me a few hundred to repair a car I really like after 100,000....so be it. On the other hand Subaru has already given me a discount to trade for a 2019, who knows I just may do it. The Subaru I have is a Forester and I have had it 9 months. What the future holds is yet to be experienced however, it has been many many years since I have had a car I enjoyed more. Gas mileage is very good, the dealer (Fairway Subaru in Greenville SC) has been just fine and now that I have AWD it makes all the sense in the world, it should be the norm. The visabality is outstanding and the seat height is also outstanding. I greatfully traded in my Toyota Corolla that I hated and I like the styling of the Subaru Forester inside and out it is practical. So if it is as good a car as I have been told my next car will be a Subaru too.